The art of book printing with the help of wooden blocks was invented in China around the eighth century CE. A double page of text was cut out of a wooden block and then printed on paper. From the eleventh century onwards, book printing in China rose to great heights. The two oldest printed double pages in Leiden date from the Yuan dynasty (1279-1368), and were produced in Northern Fujian. These loose pages are part of volume 7 (out of 17) of the Yilitu儀禮圖 “Illustrated Rules and Rites”, one of the Chinese classics. This work contains ritual rules and guidelines for behaviour on occasions such as birth, marriage and death among the elite of Ancient China. The stamps in red ink show that in 1798 the book belonged to the Imperial Tianlu linlang天祿琳琅 (“The Clang of Heavenly Favours”) library of the Qianlong Emperor, who reigned from 1735 to 1795. The stamps in question read Qianlong yulan zhi bao 乾隆御覽之寳 “Seal of Imperial Perusal by Qianlong” and Tianlu jijian 天祿繼鑑 “Continued Mirror of Heavenly Favours”. Remarkably, the short title Yili 仪礼in the margin (here in the centre) is written in the simplified characters which would later become the official writing of the People’s Republic of China. In Hong Kong, Macao and Taiwan the traditional characters are used. After the demise of the Empire in 1912, but even more so after the former Imperial family had to leave the palace in 1924, parts of the library were lost. 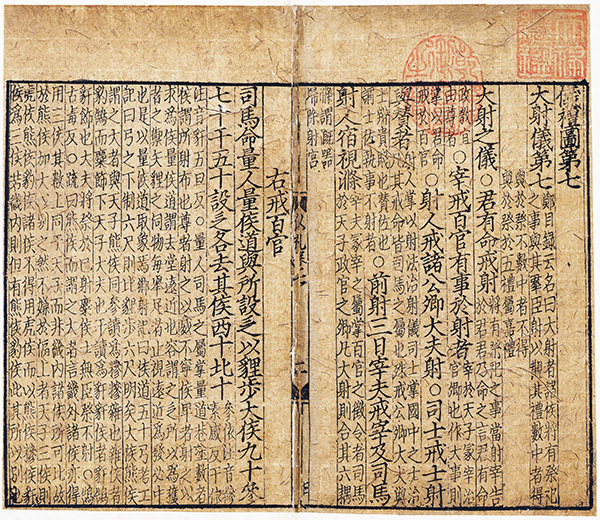 Four volumes of this work have disappeared, thirteen have been preserved in the Palace Museum in Taipei, Taiwan. These loose pages are pasted into a harmonica book with mostly nineteenth-century Chinese letters, which is now part of the Robert van Gulik Collection. Post by Koos Kuiper, former curator of Chinese and Japanese manuscripts and rare books of Leiden University Libraries.